The oil crash of 2014 spurred plans for lasting changes to the Gulf rentier economies. Headlined by Saudi Arabia’s sweeping National Transformation Program, governments across the region have sought alternative revenue sources to maintain spending and fund ambitious development strategies. To this end, new policy tools are being implemented, including a value added tax, fees for once-free government services, and reductions in water, electricity, fuel, and food subsidies (see Krane and Leber in this collection). But reforms aimed at deficit reduction pose serious challenges for authoritarian states whose citizens are accustomed to generous welfare spending and subsidies as part of the so-called “rentier bargain” of financial patronage in return for political allegiance. As other contributions in this volume describe, modern revisions to classical rentier state theory have mostly dispelled the notion of rentier citizens as politically passive rent-seekers. (See Moritz and Jones in this collection.) However, a scarcity of reliable survey data from the Middle East and North Africa region generally, and from the oil-rich Gulf states in particular, means that we still know very little about how citizens view the structural economic changes being implemented in their countries, and whether and in what ways public opinion might serve to constrain or facilitate development toward a post-oil society. What limited survey data do exist are restricted to specific fiscal policy measures, rely on direct survey questions that may be susceptible to measurement error, and sometimes are not based on representative samples. In some economic surveys, nationals and expatriates are aggregated in a way that obfuscates the behaviors and preferences of citizens. Thus, important questions remain. How does the average national in the Gulf think about the restructuring of their society? And, more significantly, in what ways will public opinion facilitate or accommodate these changes spearheaded by decisionmakers? This paper examines how ordinary citizens of resource-dependent Gulf states view and prioritize the different economic benefits to which they are entitled as citizens, including freedom from taxation, against the backdrop of post-2014 fiscal reform. To this end, our study utilizes a rare survey of Qatari citizens conducted in 2016 by the Social and Economic Survey Research Institute (SESRI) at Qatar University. The survey was conducted by telephone using a comprehensive national frame with coverage of approximately 95 percent of adult nationals. The survey was implemented at a time when oil prices hit their lowest point in a decade at around $27 US dollars per barrel. The steep decline precipitated Qatar’s first budget deficit in almost 15 years and, thereafter, the introduction of various cost-saving measures aimed at reducing the shortfall. Thus, the survey timing made questions about fiscal austerity highly salient for our survey respondents. Qatar’s vast natural gas resources and citizenry of only around 300,000 individuals afford it unparalleled capacity for financial patronage. Indeed, in 2014 its annual oil and gas rents amounted to more than $425,000 per citizen. Qatar’s unelected leadership distributes a generous portion of this income to citizens via an extensive system of welfare benefits, comprising land allotments, marriage allowances, free water and electricity, free education and medical care, tax-free salaries, and near-guaranteed employment in the public sector, where 85 percent of working citizens are employed. Its “extreme” (or “über”or “ultra-”) rentier status makes Qatar an instructive case through which to study the character and drivers of public attitudes toward economic reform of the rentier state. Rather than the exception, however, the case of Qatar is especially meaningful as an exemplar for the rest of the Gulf countries. As the recipients of the most generous welfare regime in the Gulf, Qatari perceptions about changes to wealth distribution should be relatively muted compared with Saudi Arabia or Oman, for instance, where a small increase in food or energy costs can have a substantial impact on a family’s living expenses. The Qatar case raises different question from the relatively poorer Gulf states, namely: are people’s views of things different when expectations are higher? Our survey examines how Qatari nationals view and prioritize the various financial benefits they receive by virtue of being citizens of a wealthy rentier state. Such entitlements including free public services, direct cash transfers, and exemption from taxation. A sustained period of low oil prices would necessitate cuts in benefits, but which entitlements do citizens consider essential to the rentier arrangement, and which are deemed relatively more negotiable? Rather than relying on traditional straightforward survey questions, we assess preferences via a novel survey experiment that presents subjects with a choice between competing economic alternatives. Our experiment prompts Qatari respondents to think about the budget deficit facing the country and then asks them to identify which welfare subsidies they would prioritize in the event of a reduction in state spending. The experiment presents subjects with a choice between randomized sets, or “baskets,” of public goods (that is, a specific type of spending or subsidy), and they are asked to give priority to one basket over the other. We then calculate the change in probability that a basket is selected when it includes a given good. This procedure gives a straightforward ordering of citizen preferences. In addition, by forcing subjects to select between competing material interests, the experiment mirrors the real-life tradeoffs that citizens must make amid a retrenchment of the rentier state. A final benefit of the experimental design is that it allows citizens to reject or accept certain goods indirectly without revealing their preferences to the survey enumerator, mitigating measurement error due to social desirability bias. To illustrate these benefits, in the paper’s final section we compare our experimental findings to the answers to traditional survey questions that ask citizens directly about their subsidy preferences. The survey data reveal several important findings. First, the experiment demonstrates that Qataris perceive some rentier entitlements as being significantly more essential than others: namely, universal social benefits such as free education, healthcare, water, and electricity. Conversely, more individualistic or targeted subsidies, including direct cash allowances and even financially lucrative land allotments and government employment, are rated by citizens as being less essential benefits in comparative terms. Citizens in Qatar are therefore seen to prioritize universal subsidies in the form of basic public services, over subsidies that accrue on an individual basis, despite the fact that some of the latter are more valuable in absolute financial terms. We take this as evidence that Qataris tend to prefer economic subsidies in proportion to their expected likelihood of benefiting from them. Since access to free schools, healthcare, and utilities is nonexcludable, citizens can be confident of their eligibility. However, individualistic benefits such as housing and public sector jobs are mediated by more opaque processes of distribution and eligibility requirements, both formal and informal, which render them more excludable. Another notable result from the experiment is that Qataris are less concerned about the possibility of paying taxes to the government than about potentially losing access to benefits they already enjoy. That is, citizens view the loss of existing subsidies as more problematic than the introduction of new taxes, regardless of the potential financial implications. Adding taxes could be relatively more costly over a lifetime than reducing cash allowances, for example, but also the simple five percent VAT introduced this year in some GCC countries could reflect the first step of government encroachment into a much broader income and sales tax regime. This result is consistent with principles derived from behavioral economics, discussed elsewhere in this collection, which predict that uncertainty over the consequences of new policies may cause individuals to prefer a suboptimal status quo. It may also be the case that citizens in Qatar simply lack knowledge about the practical financial implications of taxes, whereas the impact of retrenchment of other subsidies can be more easily perceived. Nonetheless, this result of the experiment is significant in light of the central place of taxation—or rather the lack thereof—in theorizing about the rentier state. The ability of rent-based economies to support citizens without extracting from them has long been posited as a fundamental aspect of rentier political economy, and one which, if violated, is expected to undermine an essential pillar of state stability in autocratic rent-dependent regimes. Yet our results suggest, at a minimum, that there is no automatic rejection of taxation among rentier citizens in line with the reverse principle of “no representation, so no taxation,” as introduced in the earliest statements of the rentier state paradigm. This finding about the surprising acceptability of taxation among Qataris accords with Krane’s 2015 survey-based conclusion, that Gulf citizens view welfare subsidies as “customary privileges” rather than the political “rights” assumed by rentier theorists. Thus, for Qataris and potentially other citizens of the Gulf, not cutting current benefits is more important than adding new expenses, even though the final cost to the individual citizen may be the same. This demonstrates the importance of keeping up the appearance of state largesse even if some subsidies are ultimately transferred back to governments via taxes. More generally, the results of the experiment would seem to confirm predictions made by international economic institutions, that if Gulf tax rates are kept low and implemented correctly, the majority of citizens should not feel a drastic impact, thus precluding social disturbances or hindering investment and economic growth opportunities. In the extreme rentier case of Qatar, at least, freedom from taxation does not seem to be an inviolable component of the rentier social contract. Beyond its substantive insights into public attitudes toward economic change in the Gulf states, our study also makes a substantial methodological contribution, demonstrating the effectiveness—and arguably the necessity—of experimental-based approaches to studying citizen preferences on complex and/or controversial topics in social science. This contribution can be observed by comparing our experimental findings to responses to corresponding direct survey questions. Whereas the survey experiment forces individuals to make a difficult choice between competing economic priorities, traditional survey questions demand no such compromise. In addition, because straightforward questions require direct responses, respondents cannot avoid revealing their preferences to the survey enumerator and thus may face incentives to conform to socially and politically acceptable opinions. Such social desirability bias may result, for example, if survey respondents view qualities like liberal-mindedness and lack of attachment to economic welfare as being more acceptable than resistance to change and financial dependence. Citizens also may be reluctant to express opinions that could be perceived as criticisms of state policy, especially in settings, such as Saudi Arabia, where reform agendas are closely associated with ruling elites and where political dissent is not only socially unacceptable but criminalized. By contrast, our experiment measures preferences indirectly, mitigating social desirability pressures. The choice experiment we employ has the added benefit of forcing respondents to designate some combinations of subsidies as more important than others. Compared to traditional question, this design better reflects the reality of benefit retrenchment by not allowing rentier citizens to have it all, as has perhaps been their custom. The result is that the experimental findings provide a meaningful ordering of preferences, which as we demonstrate below is not necessarily the case when direct questions are used instead. Many things are desirable, but not all of them are essential characteristics of an oil rich Gulf state such as Qatar. Please tell me for each of the following things how essential you think it is as a characteristic of a state like Qatar. Use this scale, where 0 means “not at all an essential characteristic” and 10 means it definitely is “an essential characteristic”. As is plain from a visual inspection of the figure, when asked directly Qataris tend to report that all benefits are essential to upholding the rentier bargain, with almost no statistically significant variation across individual items. Apart from exemption from taxation, which has a mean importance rating of 7.5, all items fall within a narrow range from between 8.4 and 9.7. 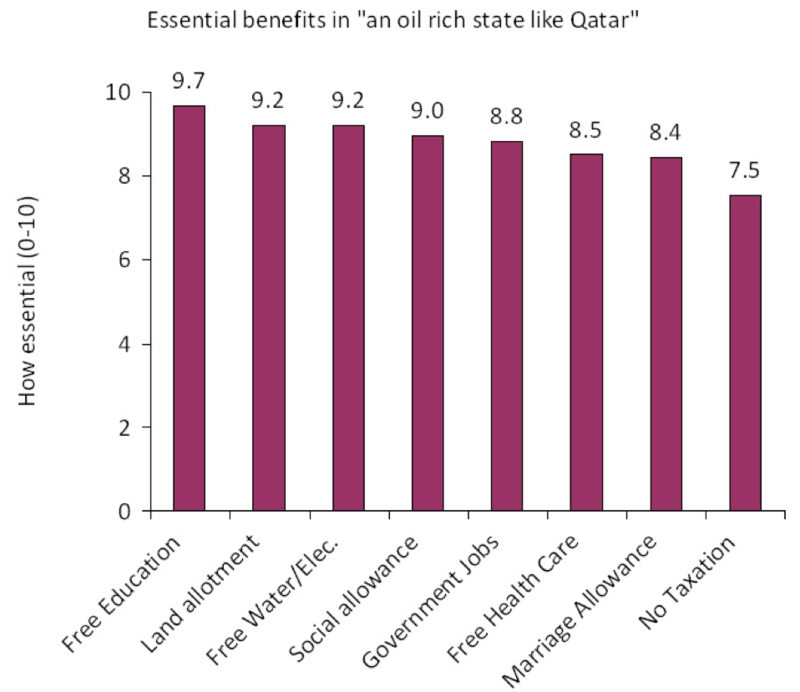 As such, the main conclusion that one can draw from Figure 1 is that no conclusions can be drawn at all: when the question is posed directly to survey respondents, no rentier benefit is deemed significantly more important to Qataris than any other, with the exception of no taxes. To understand how Qataris and other rentier citizens think about the economic tradeoffs they have been asked to make since 2014, one needs a method that reflects the real-world choices they face. The contributions in this volume examine the evolving nature of the rentier state. In so doing, they also highlight changing theoretical assumptions about state-society relations in resource-dependent economies such as describes the Arab Gulf countries and much of the broader Middle East and North Africa. Many of these conceptual revisions serve to refocus examination away from the macro effects of oil and gas dependence and toward the individual-level mechanisms that are theorized to link rent distribution to social and political outcomes of interest. In some or even many cases, better understanding of the drivers of social and political behavior in rentier states has served to complicate rather than confirm hypotheses established in the literature. Such is the case with the present study, which finds no visceral reaction against the prospect of taxation among citizens of Qatar, widely cited as the purest case of rentierism in the world today. In this task of interrogating the behavioral assumptions of rentier state theory, survey research has an important role to play, alongside other methods designed to probe the opinions and preferences of ordinary citizens. Yet opinion studies, not least those conducted in the Middle East region, must take care to account for known sources of bias that may produce misleading or ambiguous results. The findings reported in this research note demonstrate the promise of experimental approaches to gauging citizen attitudes on complex and sensitive questions. By measuring preferences indirectly and approximating real-world processes of decision-making, survey-based choice experiments can avoid the social and political desirability bias inherent in more direct solicitations of opinion, while also eliciting more meaningful responses. Steffen Hertog, “The GCC Economic Model in the Age of Austerity,” in The Gulf Monarchies Beyond the Arab Spring: Changes and Challenges, eds. Luigi Narbone and Martin Lestra (Florence: European University Institute, 2015), pp. 5–11; Justin Gengler and Laurent Lambert, “Renegotiating the Ruling Bargain: Selling Fiscal Reform in the GCC,” Middle East Journal 70(2), 321–329, 2016. Husain, A. M., Fraker, F. M., Burton, E. , Young, K. E. and Al Absi, A. A. (2016), Economic Reform and Political Risk in the GCC: Implications for U.S. Government and Business. Middle East Policy 23: 5-29. Giacomo Luciani, “Allocation vs. Production States: A Theoretical Framework,” in Hazem Beblawi and Giacomo Luciani, eds., The Rentier State: Nation, State and Integration in the Arab World (London: Croom Helm, 1987); Hossein Mahdavy, “Patterns and Problems of Economic Development in Rentier States: the Case of Iran,” in M. A. Cook, ed. Studies in the Economic History of the Middle East: From the Rise of Islam to the Present Day (London: Oxford University Press, 1970); Michael L. Ross, “Does Oil Hinder Democracy?” World Politics 53(3): 325-361, 2001. Louay Bahry, “The Opposition in Bahrain: A Bellwether for the Gulf?” Middle East Policy 5(2): 42-57, 1997; Gwenn Okruhlik, “Rentier Wealth, Unruly Law, and the Rise of Opposition: The Political Economy of Oil States,” Comparative Politics 31(3): 295–315, 1999; Louay Bahry, “The Socioeconomic Foundations of the Shiite Opposition in Bahrain,” Mediterranean Quarterly 11(3): 129-143, 2000; Matthew Gray, “A Theory of ‘Late Rentierism’ in the Arab States of the Gulf,” Center for International and Regional Studies Occasional Paper No. 7 (Doha: Georgetown University School of Foreign Service in Qatar, 2011); Justin Gengler, Group Conflict and Political Mobilization in Bahrain and the Arab Gulf: Rethinking the Rentier State (Bloomington: Indiana University Press, 2015); Courtney Freer, Rentier Islamism: The Influence of the Muslim Brotherhood in Gulf Monarchies (Oxford University Press, 2018). See also Moritz, this collection. Mark A. Tessler, Public Opinion in the Middle East: Survey Research and the Political Orientations of Ordinary Citizens (Bloomington: Indiana University Press, 2011). Justin Gengler, Kien T. Le, and David Howell, “Survey Challenges and Strategies in the Middle East and Arab Gulf Regions,” in Timothy P. Johnson, et al., eds, Advances in Comparative Survey Methods: Multinational, Multiregional and Multicultural Contexts (3MC) (New York: Wiley & Co., 2018); Justin Gengler, “The dangers of unscientific surveys in the Arab world,” The Washington Post, October 27, 2017. For example, Jim Krane, “The Political Economy of Subsidy Reform in the Persian Gulf Monarchies,” in Jon Strand, ed., The Economics and Political Economy of Energy Subsidies (Cambridge, MA: MIT Press, 2015). Alvaredo, Facundo, Lydia Assouad, and Thomas Piketty. April 2018. “Measuring Inequality in the Middle East 1990-2016: The World’s Most Unequal Region?.” World Inequality Database Working Paper 2017/15 (2017). E.g., “Kahramaa Hikes Water, Electricity Tariffs,” Gulf Times, October 13, 2015; Lesley Walker, “Qatar Cabinet Annuls Seha as Tenders for Private Insurers Readied,” Doha News, December 31, 2015; Shabina S. Khatri and Peter Kovessy, “Qatar Emir: Government Can No Longer ‘Provide for Everything,’” Doha News, November 3, 2015; Lesley Walker and Peter Kovessy, “Qatar to Raise Petrol Prices at Midnight Tonight,” Doha News, January 14, 2016. Jure Snoj, “Population of Qatar by nationality – 2017 report,” Priya Dsouza Communications, February 7, 2017. Jocelyn S. Mitchell, “Beyond Allocation: The Politics of Legitimacy in Qatar,” Ph.D. dissertation, Georgetown University, 2013. Hilal Halaoui, Salim Ghazaly, Karim Aly, Joe Youssef Malek, and Rawia Abdel Samad, “Private-sector participation in the GCC: Building foundations for success,” strategy& Ideation Center insight, 2017. Michael Herb, “A Nation of Bureaucrats: Political Participation and Economic Diversification in Kuwait and the United Arab Emirates,” International Journal of Middle East Studies 41(3): 375–395, 2009. Matthew Gray, “The categorization and delineation of rentierism: With special reference to tourism,” paper presented at the 2014 Gulf Research Meeting, Cambridge University, July 6-8. Courtney Freer, Rentier Islamism: The Influence of the Muslim Brotherhood in Gulf Monarchies (Oxford University Press, 2018). See, e.g., Anton J. Nederhof, “Methods of Coping with Social Desirability Bias: A Review,” European Journal of Social Psychology 15(3): 263-280, 1985; Ivar Krumpal, “Determinants of social desirability bias in sensitive surveys: a literature review,” Quality & Quantity 47(4): 2025-2047, 2013. Ross, M. L. (2004). Does taxation lead to representation? British Journal of Political Science 34(2): 229-249; Herb, M. (2005). No representation without taxation? Rents, development, and democracy. Comparative Politics, 297-316. Vandewalle, D. (2015). Political aspects of state building in rentier economies: Algeria and Libya compared. In The Rentier State (pp. 173-185). Routledge. S. Diaa, “IMF: GCC countries need to ‘reengineer tax systems,’” Gulf News, February 22, 2016; N. Parasie, “As oil profits plunge Gulf regimes weigh the unmentionable: taxes,” The Wall Street Journal, February 14, 2016. Ahmed, N., S. Halstead, &; A. Law. (2015). VAT in the GCC: Old news or new chapter. Deloitte &; Touche Whitepaper (August). Lindsay J. Benstead, “Survey Research in the Arab World: Challenges and Opportunities,” PS: Political Science and Politics 51(3): 535-542, 2018.